A dermatologist is a type of medical doctor who focuses on skin conditions and diseases, as well as those that affect the hair and nails. According to the American Academy of Dermatology, these doctors treat more than 3,000 different conditions of these parts of the body. Read on to learn more about some of the most common conditions that a dermatologist will treat and medical services he or she offers. Acne is the most common skin condition in the United States, characterized by blemishes on the skin, pimples, and blackheads. While it can often be treated at home, severe cases may benefit from the intervention of a dermatologist. He or she can recommend topical acne treatments, medications that can help clear acne, and procedures to reduce scarring caused by blemishes. Skin cancer is the most common type of cancer in the United States, affecting more than two million people each year. The good news is that this type of cancer is highly treatable when caught early. 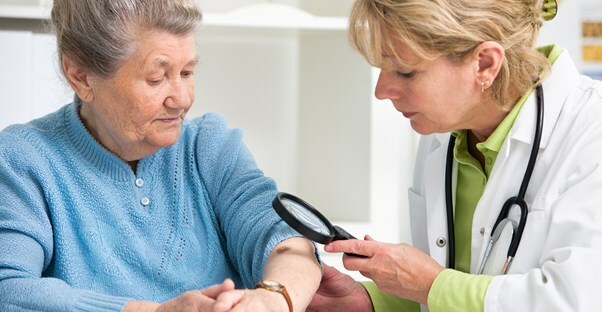 A dermatologist can help monitor the skin for signs of cancer, diagnose the disease, and manage treatment and follow-up. Eczema is a term for a skin irritation that causes swelling, redness, blisters, and other discomfort. Sometimes called dermatitis, eczema comes in several different forms, some of which are chronic and others that are caused by an allergic reaction or contact with an object that causes irritation. A dermatologists can diagnose and provide and ongoing treatment of eczema and related skin conditions. Psoriasis is a chronic illness in which the skin receives faulty signals from the brain, causing the skin cells to grow too quickly. The disease has different symptoms based on the type of psoriasis you have, but is generally characterized by itchy, scaly patches on the skin. While there is no cure for this illness, a dermatologist can provide ongoing treatments that help manage symptoms. Beyond skin conditions, dermatologists often treat nail infections and fungus. These infections develop when bacteria enters a small cut in the skin, and are often associated with manicure and pedicure procedures. Those with diabetes are also prone to nail infections. Dermatologists diagnose and treat these ailments, often with a combination of oral and topical medication.